Step off the beaten path and head to Spas & Wellness and Tambomachay. And it doesn't end there: explore the ancient world of Sacsayhuaman, take a pleasant ride with a tour on horseback, contemplate the long history of Plaza de Armas, and examine the collection at Qorikancha. To see photos, where to stay, and more tourist information, use the Cusco trip planner . Belo Horizonte, Brazil to Cusco is an approximately 14.5-hour combination of bus and flight. You can also drive; or take a bus. The time zone changes from Brasilia Time (BRT) to Peru Time (PET), which is usually a -2 hour difference. Traveling from Belo Horizonte in July, expect nights in Cusco to be colder, around 1°C, while days are slightly colder, around 24°C. Finish your sightseeing early on the 12th (Fri) so you can drive to Ollantaytambo. Retaining much of its centuries-old architecture, Ollantaytambo represents one of the world's finest examples of Incan city planning. Kick off your visit on the 13th (Sat): admire the verdant scenery at Perolniyoq Waterfall, admire the sheer force of Catarata Perolniyoc, then stop by Misha Wasi, and finally don't miss a visit to Qosqo Ayllu. For ratings, maps, reviews, and more tourist information, go to the Ollantaytambo day trip planning site . You can drive from Cusco to Ollantaytambo in an hour. Another option is to take a bus. In July, daily temperatures in Ollantaytambo can reach 24°C, while at night they dip to 1°C. Finish your sightseeing early on the 14th (Sun) so you can travel to Puno. Hugging the western tip of Lake Titicaca, Puno serves as a melting pot of indigenous and imported cultures, and makes a great base for explorations around the region. On the 14th (Sun), stroll the grounds of Sillustani and then step off the mainland to explore Taquile Island. On the 15th (Mon), you'll have a packed day of sightseeing: contemplate the waterfront views at Lake Titicaca, don't miss a visit to Arco Deustua, then contemplate the long history of La Casa del Corregidor, then take some stellar pictures from Mirador Ing. Eduardo Sanchez, and finally don't miss a visit to Portal de Aramu Muru. To see maps, more things to do, where to stay, and tourist information, you can read our Puno journey builder app . Traveling by combination of bus and flight from Ollantaytambo to Puno takes 4.5 hours. Alternatively, you can drive; or take a bus. Expect slightly colder temperatures when traveling from Ollantaytambo in July; daily highs in Puno reach 20°C and lows reach -5°C. Cap off your sightseeing on the 15th (Mon) early enough to go by car to Arequipa. Step off the beaten path and head to Historic Centre of Arequipa and Mirador Carmen Alto. 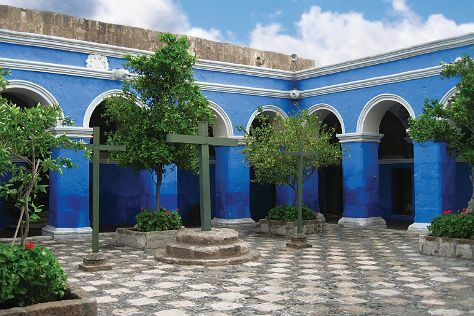 There's much more to do: see the interesting displays at Monasterio de Santa Catalina, take an in-depth tour of Museo Santuarios Andinos, admire the striking features of Yanahuara, and take in the spiritual surroundings of Iglesia de San Miguel Arcangel. To find where to stay, photos, ratings, and more tourist information, use the Arequipa trip itinerary builder tool . You can drive from Puno to Arequipa in 4.5 hours. Another option is to take a bus. Traveling from Puno in July, you can expect nighttime temperatures to be warmer in Arequipa, with lows of 9°C. Finish up your sightseeing early on the 18th (Thu) so you can go by car to Nazca. The southern city of Nazca draws visitors to its archaeological and historical sites. Start off your visit on the 19th (Fri): stroll the grounds of Cementerio Chauchilla, delve into the distant past at Cantalloc Aqueduct, see the sky in a new way at Planetario Maria Reiche, then make a trip to Ceramicas LASC, and finally make a trip to Nasca Lines. On the 20th (Sat), you'll have a packed day of sightseeing: get outside with Lomas de Marcona y Punta San Fernando, then look for gifts at Taller de Ceramicas Emilia, and then delve into the distant past at Cahuachi. You can plan Nazca trip in no time by asking Inspirock to help create your itinerary. Drive from Arequipa to Nazca in 7 hours. Alternatively, you can take a bus; or do a combination of flight, taxi, and bus. 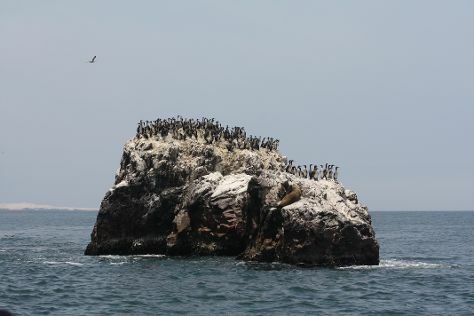 Cap off your sightseeing on the 20th (Sat) early enough to go by car to Paracas. A port town largely devoted to tourism, Paracas serves as a popular starting point for exploration of Peru's south coast. Start off your visit on the 21st (Sun): have some family-friendly fun at Paracas Time Machine, then make a trip to The Chandelier, then fly like a bird with a parasailing or paragliding tour, and finally step off the mainland to explore Islas Ballestas. On the next day, take in the exciting artwork at Pukasoncco, Arte Precolombino. and then enjoy the sand and surf at Playa Roja. For traveler tips, photos, where to stay, and other tourist information, use the Paracas online trip itinerary builder . Getting from Nazca to Paracas by car takes about 3.5 hours. Other options: take a bus. Expect a daytime high around 23°C in July, and nighttime lows around 15°C. Wrap up your sightseeing on the 22nd (Mon) to allow time to drive to Lima. Start off your visit on the 23rd (Tue): pause for some serene contemplation at Iglesia y Convento de San Francisco, admire the masterpieces at Museo de Arte de Lima - MALI, glide through the air with a parasailing or paragliding tour, then make a trip to Miraflores, and finally stroll through Circuito Magico Del Agua. Keep things going the next day: take an in-depth tour of Museo Larco, then delve into the distant past at Huaca Pucllana, and then admire the local landmark of Circuito Magico del Agua. To see traveler tips, maps, where to stay, and tourist information, go to the Lima trip itinerary site . Getting from Paracas to Lima by car takes about 3.5 hours. Other options: take a bus. Expect a daytime high around 22°C in July, and nighttime lows around 19°C. Wrap up your sightseeing by early afternoon on the 25th (Thu) to allow time for travel back home.